These speakers are designed to offer much of the performance of bigger studio monitors, but for DJs and producers who have to work in very small spaces, and so who need something "micro". Nowadays, the bedroom DJ can be doing a lot more than just practising from their home set-up. With the advent of laptop production software and video streaming services, for instance, such DJs can both make music and perform live from their homes. IK Multimedia recently launched two products that would be useful to just such DJs and DJ/producers: the iLoud Micro Monitors, and the iKlip Grip Pro. We take a first look at both today. 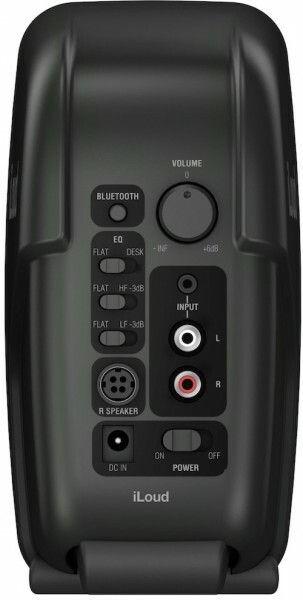 IK Multimedia is claiming these impossibly tiny powered speakers (also see main pic) are "ultra compact reference studio monitors". 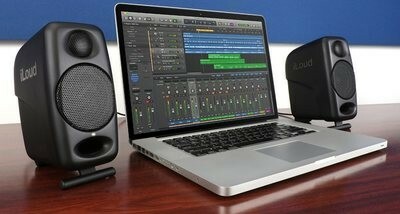 The idea is that, in box bedroom studios, there is usually no room for "proper" studio monitors for DJ practice and production, but at the same time, DJ/producers want more than computer speakers. These little speakers pack 50W of power, and the DSP-controlled frequency response means they can give the illusion of bass much deeper than that which small cabinets such as this can physically produce. They can be mounted on mic stands, and have a front foot for angling to your listening position. As you'll probably only have one set of speakers to do everything, they also have Bluetooth (for easy streaming), useful 1/8" jack and 2 x RCA inputs, and - says IK Multimedia - a "sweet spot" closer to the speakers than is usual for monitors. This means you can be right up against them in a cramped space and still get a balanced, clear sound. While not cheap, you will almost definitely get what you pay for here. We would ordinarily be dubious, but we have heard first-hand the quality of a related product from them (the iLoud portable speaker), and are looking forward to properly testing these - but the omens are good. • Price: €/$299 a pair. See them on IK Multimedia's site here.